Clean the outside of the oyster under running water to remove any loose grit or barnacles. Rub the shell with your fingers or use a stiff brush if you have one for this purpose. Hold the oyster in a towel or oven mitt with the hinge (pointed side) sticking out. This will protect your hand if the oyster knife slips. Do not use a regular knife to open oysters. There is too great a risk of slipping and severely injuring yourself. An oyster knife is a special blunted knife made for this purpose. They're cheap, too. If you're going to buy oysters in the shell, spend a couple extra bucks for the proper knife. Holding the oyster firmly, slide the knife around the lip of the oyster until you reach the other side of the hinge. The oyster should remain level, so you don't lose the liquid inside. Keep the knife inserted about 1/2 inch with the tip pointed slightly up. Keep the oyster level and pry the shell apart with your fingers. Before separating the shells completely, use the oyster knife to detach any muscle that still clings to the inside of the top shell. Carefully wipe away any grit that may be on the inside of the completely opened oyster. Never wash an oyster after it has been opened. This will definitely affect the flavor. 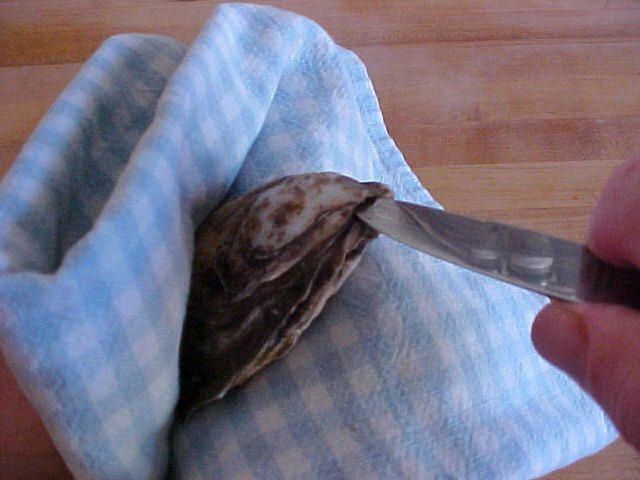 Use the oyster knife to detach the muscle underneath the oyster from the bottom shell. Be careful not to spill the liquid. Place the opened oysters on a bed of crushed ice or refrigerate. Serve with lemon wedges or a mignonette sauce (1/2 cup red wine vinegar, 2 shallots finely chopped, 1/2 teaspoon coarsely ground black pepper and 1/8 teaspoon salt). What is the Correct Method for Handling Durians?